Our last report described gas-and-steam plumes in October and November 2010 that rose from Pagan's active cone located on the N side of the island (BGVN 35:12). After that, the Volcanic Alert Level and Aviation Color Code were reduced from Advisory (Yellow) to Unassigned on 22 February 2011. The Alert was raised again to Advisory ("Volcano is exhibiting signs of elevated unrest above known background level") on 23 April 2011 where it remained level through the end of 2012. In this report, we tabulate and briefly comment on advisories from the Washington Volcanic Ash Advisory Center (VAAC) that reported Pagan's gas emissions, occasional ash plumes, and thermal anomalies. Reports of activity were also contributed by observers from other islands and a passing research vessel. We also share the results from the ash transport and dispersion model, PUFF, for the 30 January 2012 ash emission. MODVOLC thermal alerts were triggered several times during this reporting period, mainly in late 2012. Clear images from satellites and the International Space Station are also included in this report. The primary methods of monitoring Pagan are satellite remote sensing and visual observations from the Emergency Management office (based in Saipan), local residents of the islands, and mariners. Pagan lacks ground-based geophysical instrumentation dedicated to volcano monitoring. During this reporting period, the closest operating seismometers were located over 155 km away on the islands of Sarigan, Anatahan, Rota, and Saipan (figure 11). Figure 11. Pagan is one of the 15 volcanic islands within the Commonwealth of the Northern Marianas Islands. This region of the volcanic arc (Mariana Arc) is the N half of a ridge which extends about 2-4 km above the ocean floor; to the E of the arc lies the Mariana Trench where depths reach greater than 6 km (Trusdell and others, 2006). This map also labels the five submarine features Esmeralda Bank, NW Rota, and the seamounts (SMT) Tracey, Taga, and Ruby. Courtesy of Trusdell and others (2006) and Google Earth (Terra Metrics Image IBCAO, 2013; Cnes/Spot Image, 2013). 2011 activity. With the exception of a diffuse steam-and-gas plume observed on 24 January 2011, no unusual activity at Pagan volcano had been detected in satellite imagery during January-March. On 23 April, a Northern Mariana Islands status report noted that a NOAA research vessel in the vicinity of Pagan reported incandescence at the summit of the volcano at night. Satellite image observations were obscured by clouds during that time. Between 27 June and 1 September, the Washington VAAC reported that emissions were visible from Pagan (table 3). Gas and possible ash were noted based on satellite imagery from MTSAT (Multifunctional Transport Satellites), meteorological centers, and Global Forecast System (GFS) Winds. GFS is a model developed by NOAA's National Centers for Environmental Prediction. Ash emissions appeared in satellite imagery on 1 September during an event that produced a plume that rose 2.4 km above sea level (a.s.l.). That day, the Saipan Emergency Management Center also reported that gases and ash were visible. Table 3. Summit activity from Pagan included ash plumes during 27 June 2011-2 December 2012 as reported by the Washington VAAC and hotspot notifications from MODVOLC. The VAAC frequently incorporated data from several sources as noted in the "Reporting Source" column. Note that "Altitude" values are approximate from the flight levels provided in the original online reports. Courtesy of the Washington VAAC and Hawai`i Institute of Geophysics and Planetology (HIGP) Thermal Alerts System. Northern Mariana Islands status reports noted that low-level gas-and-steam plumes with possible fine ash were detected in satellite imagery (as well as noted by observers on the island) on 7 July and during 26 August-2 September 2011. From 28 October to 2 December, status reports noted satellite observations of a persistent gas-and-steam plume drifting from the island. 2012 activity. During 2012, the Washington VAAC released periodic notices describing emissions from Pagan; these reports were primarily during January, April, July, November, and December (table 3). The tallest plumes rose 3 km a.s.l. with various drift directions (S, E, SSW, N, and NW). The Marianas Emergency Management Center reported local observations of ashfall on the island on 9 July 2012. PUFF volcanic ash transport and dispersion simulations. The results from a volcanic ash tracking model were available for the 30 January 2012 ash event (figure 12). Simulations from the PUFF model provided the extent of ash for a plume with starting conditions determined by the Washington VAAC; the time of the eruption, reported plume heights, drift direction and speed were required for the model. "The intent of PUFF is to show the position of eruption clouds when satellite image observations are not available, and to use satellite observations, when available, to validate or improve simulations (Searcy and others, 1998)." The model is frequently used for ash events within the N Pacific air traffic region and assists the Alaska Volcano Observatory (AVO, a joint program of the United States Geological Survey, USGS, the Geophysical Institute of the University of Alaska Fairbanks, UAFGI, and the State of Alaska Division of Geological and Geophysical Surveys, ADGGS) and other agencies. Figure 12. Three simulations of ash dispersal based on Pagan's 30 January 2012 event were available from the PUFF volcanic ash dispersion model. At 1050, 1250, and 1450, the three-dimensional model forecasted ash distribution drifting in a narrow band E of the island. Initial drift parameters were determined by the Washington VAAC (start time = 0849 UTC on 30 January 2012, plume heights = 1.5 km and 3 km, drift = E at 5-10 knots). The plume top reached a calculated maximum of 3.048 km a.s.l. The location of Pagan is indicated with the star; the northernmost island in view is Asuncion Island (~177 km NNW) and the southernmost island is Saipan (~315 km S). The PUFF volcanic ash dispersion and transport model was developed by the University of Alaska Fairbanks Geophysical Institute (UAF-GI). Courtesy of Peter Webley, UAF-GI. The simulation for the 30 January 2012 ash event began at 1050 UTC and showed that, by 1450 UTC, ash had drifted E in a narrow band with a maximum altitude of 3.048 km. This result correlates well with satellite observations reported by the Washington VAAC at 1041 (table 3); after that time, the Washington VAAC reported that ash was possible but not detectable during the time period that the Puff model forecasted ash extending further E.
The PUFF model was recently expanded to include an interface with Google Earth. Ash dispersion results can be viewed in Google Earth including the plume start time, altitude and simulation length, two-dimensional maps of ash with time stamps (color coded by altitude), and the three-dimensional ash cloud. This interface also allows selection by ash particle so the user can view its location, its volcanic origin, the elapsed time since the eruption began, and altitude (in km and feet a.s.l.) (Webley and others, 2008). Thermal anomaly detection in 2012. Hotspots from the summit region were detected by the MODIS instrument (onboard the Terra and Aqua satellites) during 2012. The MODVOLC hotspot alerting system recorded six significant thermal anomalies between 6 August and 11 December (figure 13). Thermal anomalies appeared at least once per month between October and December 2012 suggesting clear viewing conditions during times of elevated activity (table 3). Figure 13. During 2012, the MODVOLC system detected elevated temperatures in the area of Pagan's summit, located at the N end of the island. This image includes hotspots detected during the year and listed in table 3. Courtesy of the Hawai`i Institute of Geophysics and Planetology (HIGP) Thermal Alerts System. A view of Pagan from the International Space Station. On 6 March 2012, an astronaut on the International Space Station photographed Pagan Island during spectacular viewing conditions (figure 14). With a digital camera, the entire extent of the island was captured as well as a persistent white plume drifting from the summit area. Some clouds had gathered around the southern region of the island (a narrow peninsula of older volcanic centers), but the main features of the island were easy to distinguish. 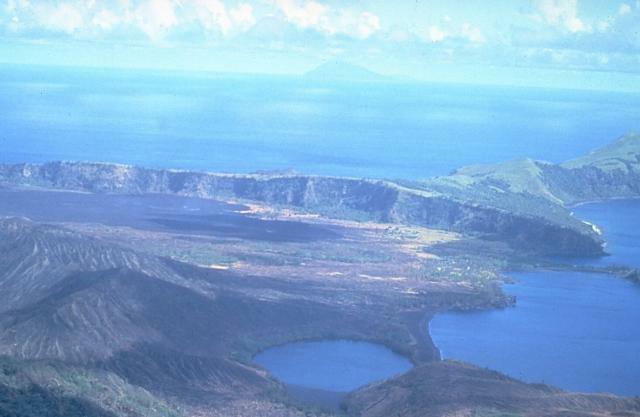 Historical lava flows appeared dark brown and black within the large (5.5 km wide), circular caldera (a feature that dominates the N end of the island) (Trusdell and others, 2006). The youngest lava flows date from 1981, however, lavas from an eruption during 1872-1873 reached the N shoreline; note the black region in contrast with the vegetated shoreline at the right-hand side of the photo. Figure 14. On 6 March 2012, a steam plume was drifting WSW from Pagan Island's northernmost peak, Mount Pagan, the highest point on the island. This photo was taken by an astronaut with the Expedition 30 crew on the International Space Station while orbiting ~480 km above the Pacific Ocean. The viewing angle and distance from the station caused some skewing of the image; the image was cropped and enhanced, improving contrast and removing lens artifacts. Astronaut photograph ISS030-E-122047. Courtesy of NASA-JSC. MODIS satellite images: May and October 2012. On 7 May, the MODIS instrument on the Terra satellite acquired a clear image of Pagan Island with a conspicuous plume of gas and steam drifting W (figure 15). The plume's blue tint suggested the presence of sulfur dioxide. According to NASA's Earth Observatory, the Ozone Monitoring Instrument (OMI) on the Aura satellite detected elevated levels of SO2 just W of the volcano several hours after this image was acquired. The USGS reported that minor steam-and-gas plumes were observed in partly cloudy satellite images during 4-11 May. Figure 15. This satellite image of Pagan Island is a natural-color view of emissions drifting W on 7 May 2012. The small volcanic island of Alamagan is in view ~55 km S of Pagan. NASA's Earth Observatory noted that, for three years, North Pagan had emitted intermittent volcanic plumes. By mid-2011, Pagan's activity was nearly continuous, and NASA's MODIS instrument detected a plume almost every time there was a clear view. Courtesy of NASA and Jeff Schmaltz, LANCE/EOSDIS MODIS Rapid Response Team, GSFC. According to NASA's Earth Observatory, a satellite image acquired on 16 October showed a steam-and-gas plume drifting WNW (figure 16). Scattered clouds filled much of the view but the island was mostly cloud-free with a plume trailing into the denser bands of clouds. Figure 16. This image of Pagan Island shows a gas plume drifting WNW on 16 October 2012. The MODIS instrument on board the Aqua satellite captured this natural-color image. Note that the blue-tinted plume becomes more diffuse with distance but remains visible up to ~160 km from the island (extending to the upper left-hand corner of the image). The green outline of Agrigan island is partly obscured by cloud-cover, but is visible ~70 km N of Pagan island. Courtesy of NASA and Jeff Schmaltz, LANCE/EOSDIS MODIS Rapid Response Team, GSFC. References. Searcy, C., Dean, K., and Stringer, W., 1998. PUFF: A high-resolution volcanic ash tracking model, Journal of Volcanology and Geothermal Research, 80, pp. 1-16. Trusdell, F.A., Moore, R.B., and Sako, M.K., 2006. Preliminary Geologic Map of Mount Pagan Volcano, Pagan Island, Commonwealth of the Northern Mariana Islands, U.S. Geological Survey Open-File Report 2006-1386 (URL: http://pubs.usgs.gov/of/2006/1386/). Webley, P.W., Dean, K., Bailey, J.E., Dehn, J., and Peterson, R., 2008. Automated forecasting of volcanic ash dispersion utilizing Virtual Globes, Natural Hazards, 51, 2, pp. 345-361. Information Contacts: Emergency Management Office of the Commonwealth of the Northern Mariana Islands (EMO-CNMI) and USGS Volcano Hazards Program, PO Box 100007, Saipan, MP 96950, USA (URL: http://www.cnmihsem.gov.mp/, http://volcanoes.usgs.gov/nmi/activity/); Frank Trusdell, Hawaiian Volcano Observatory, PO Box 51, Hawaii National Park, HI, 96718-0051; Washington Volcanic Ash Advisory Center (VAAC), Satellite Analysis Branch (SAB), NOAA/NESDIS E/SP23, NOAA Science Center Room 401, 5200 Auth Rd, Camp Springs, MD 20746, USA (URL: http://www.ospo.noaa.gov/Products/atmosphere/vaac/); Hawai`i Institute of Geophysics and Planetology (HIGP) Thermal Alerts System (MODVOLC), School of Ocean and Earth Science and Technology (SOEST), Univ. of Hawai`i, 2525 Correa Road, Honolulu, HI 96822, USA (URL: http://modis.higp.hawaii.edu/); Peter Webley, University of Alaska Fairbanks Geophysical Institute, 909 Koyukuk Drive, Fairbanks, AK, 99775, USA (URL: http://www.gi.alaska.edu/); NASA Earth Observatory, NASA Goddard Space Flight Center (URL: http://earthobservatory.nasa.gov/). Low-level unrest continued at Pagan during the week of 20 June; seismicity remained above background levels. A steam-and-gas plume was visible in web camera and clear satellite images. The Aviation Color Code remained at Yellow and the Volcano Alert Level remained at Advisory. Low-level unrest continued at Pagan during 27 December 2013-2 January 2014; seismicity remained above background levels. A robust steam-and-gas plume was occasionally visible in web camera images during the reporting period. A small explosion was detected at about 0145 on 28 December. It may have produced a diffuse ash emission, but the webcam was not in operation at the time to verify. The Aviation Color Code remained at Yellow and the Volcano Alert Level remained at Advisory. The seismic network at Pagan recorded tremor and small discrete earthquakes during 9-16 August, indicating low-level unrest. A steam-and-gas plume was visible in satellite images during periods of clear weather and from web-camera images. A small explosion with a relatively high amplitude seismic component and small infrasound component occurred at 0010 on 12 August. The data suggested that degassing increased about 30 sec after the event. The Aviation Color Code remained at Yellow and the Volcano Alert Level remained at Advisory. Satellite imagery showed a vigorous plume of gas and steam drifting from Pagan during periods of clear weather from 15 to 21 June. A field crew working on the island confirmed the emissions. This activity was typical of Pagan in the recent months; no ash had been detected in satellite images. Satellite imagery showed a plume of gas and water vapor drifting 240 km downwind from Pagan daily during 9-15 February. A USGS team that visited Pagan on 9 February observed a continuous, vigorous plume and noted a sulfur odor downwind of the summit. Satellite imagery showed a plume drifting from Pagan during 1-7 December. On 29 November observers in Saipan reported hazy sky conditions associated with N winds that pushed the gas-and-vapor plume from Pagan S. Since then, no additional reports of haze or vog associated with the Pagan plume were noted. Clear satellite views showed steam-and-gas emissions drifting from Pagan during 17-24 November. According to the Washington VAAC, ash from an unknown volcano was reported by a pilot in the vicinity of Pagan on 25 November. Satellite imagery suggested continuing degassing, but it was possible that ash was present in a 30-km-wide plume that was drifting almost 90 km S. Mostly gas was seen drifting S in an image later that day. Continuous steam-and-gas plumes from Pagan were observed in clear satellite images during 12-19 October. According to NASA's Earth Observatory, a satellite image acquired on 16 October showed a steam-and-gas plume drifting WNW. The Aviation Color Code remained at Yellow and the Volcano Alert Level remained at Advisory. Minor steam-and-gas plumes from Pagan were observed in satellite images during clear periods from 20 to 27 July. The Aviation Color Code remained at Yellow and the Volcano Alert Level remained at Advisory. According to the USGS, a minor, low-altitude ash cloud from Pagan was reported by the Washington VAAC on 10 July and confirmed by the Alaska Volcano Observatory (AVO). The VAAC noted that the plume drifted almost 50 km NW at an altitude of 1.5 km (5,000 ft) a.s.l. Local observers indicated localized ashfall on or near the island. The Volcano Alert Level remained at Advisory and the Aviation Color Code remained at Yellow. According to NASA's Earth Observatory, a satellite image of Pagan acquired on 7 May showed a gas-and-steam plume drifting W. The plume's blue tint suggested the presence of sulfur dioxide; elevated levels of sulfur dioxide to the W of the volcano were detected in satellite images later that day. The USGS reported that minor steam-and-gas plumes were observed in partly cloudy satellite images during 4-11 May. The Volcano Alert Level remained at Advisory and the Aviation Color Code remained at Yellow. Minor steam-and-gas plumes from Pagan were observed in satellite images during clear periods from 6 to 13 April. The Aviation Color Code remained at Yellow and the Volcano Alert Level remained at Advisory. According to the Washington VAAC satellite images showed a plume that drifted N. Satellite images and pilot reports indicated no ash in the plume. Emissions to the W had become diffuse. Clear-to-partly-cloudy satellite images of Pagan showed a gas-and-steam plume extending downwind from the summit vent during 30 March-6 April. The Aviation Color Code remained at Yellow and the Volcano Alert Level remained at Advisory. According to the Washington VAAC a pilot observed a plume containing a small amount of ash that rose to an altitude below 1.5 km (5,000 ft) a.s.l. on 7 April. Satellite imagery showed a gas-and-steam plume, with possible ash content, drifting 204 km SSW. Low-level gas-and-steam plumes from Pagan were observed in satellite imagery during 20-27 January. Based on information from the Honolulu MWO, satellite imagery, and a pilot observation, the Washington VAAC reported gas emissions and a possible light-brown ash plume drifting E on 30 January. The Aviation Color Code remained at Yellow and the Volcano Alert Level remained at Advisory. A Northern Mariana Islands status report noted that clear to partly-cloudy satellite images showed a persistent gas-and-steam plume drifting from Pagan during 25 November-2 December. The Aviation Color Code remained at Yellow and the Volcano Alert Level remained at Advisory. A Northern Mariana Islands status report noted that clear to partly-cloudy satellite images showed a persistent gas-and-steam plume drifting from Pagan during 28 October-4 November. The Aviation Color Code remained at Yellow and the Volcano Alert Level remained at Advisory. A Northern Mariana Islands status report noted that during 26 August-2 September low-level vapor plumes from Pagan, possibly containing minor amounts of ash, were visible in satellite imagery. Reports from people on Pagan Island also indicated intermittent low-level but diffuse ash emissions and trace amounts of ashfall on parts of the island. The Aviation Color Code remained at Yellow and the Volcano Alert Level remained at Advisory. A Northern Mariana Islands status report noted that on 7 July a low-level gas-and-steam plume with possible fine ash was detected in satellite imagery as well as noted by observers on the island. Low-level gas-and-steam plumes had been detected in satellite imagery during the previous few weeks. The Aviation Color Code remained at Yellow and the Volcano Alert Level remained at Advisory. On 23 April, a Northern Mariana Islands status report noted that a NOAA research vessel in the vicinity of Pagan reported night time observations of incandescence at the summit of the volcano. Eruptive activity was considered currently to be at a low level; however with the possibility that the activity may escalate the Aviation Color Code for Pagan was raised to Yellow and the Volcano Alert Level to Advisory. Recent satellite image observations were obscured by clouds. On 22 February, the Aviation Color Code and the Volcano Alert Level for Pagan were lowered to Unassigned. With the exception of a faint steam-and-gas plume observed on 24 January, no unusual activity at Pagan volcano had been detected in satellite imagery during the previous six weeks. Pagan is not monitored with ground-based geophysical instrumentation; the only source of information is satellite observations and occasional reports from island visitors. Low-level gas-and-steam plumes from Pagan were observed in satellite imagery during 1-4 November. The Aviation Color Code remained at Yellow and the Volcano Alert Level remained at Advisory. Pagan is not monitored with ground-based geophysical instrumentation; the only source of information is satellite observation and occasional reports from observers who visit the island. Low-level gas-and-steam plumes from Pagan were observed in satellite imagery during 24 and 26-27 October. The Aviation Color Code remained at Yellow and the Volcano Alert Level remained at Advisory. Pagan is not monitored with ground-based geophysical instrumentation; the only source of information is satellite observation and occasional reports from observers who visit the island. Minor gas-and-steam plumes from Pagan continued to be observed in satellite imagery during breaks in cloud cover from 25 June to 2 July. The Washington VAAC reported that on 5 July a small cloud of ash mixed with a gas plume was observed in satellite imagery. The Aviation Color Code remained at Yellow and the Volcano Alert Level remained at Advisory. Minor gas-and-steam plumes from Pagan continued to be observed in satellite imagery during 18-25 June. The Aviation Color Code remained at Yellow and the Volcano Alert Level remained at Advisory. Satellite imagery revealed steam plumes from Pagan during 14-21 May. On 21 May researchers camping on the island reported that a trace amount of ash was deposited on their tents from activity through the night. The Aviation Color Code remained at Yellow and the Volcano Alert Level remained at Advisory. During 7-14 May, satellite imagery revealed that a robust steam plume from Pagan drifted W and a diffuse gas plume drifted farther in the same direction. Researchers camped on the island reported no unusual activity. The Aviation Color Code remained at Yellow and the Volcano Alert Level remained at Advisory. Steam and gas plumes from Pagan were seen in satellite imagery on 28 April (UTC) and 3 May; no unusual thermal activity was identified. A visitor to the island saw a minor ash emission on the morning of 3 May. The Aviation Color Code was raised to Yellow and the Volcano Alert Level was raised to Advisory on 6 May based on the recent satellite observations and confirmed minor ashfall on the island. Based on analyses of satellite imagery, the Washington VAAC reported that on 14 August a 2-hour-long thermal anomaly detected over Pagan was followed by a small emission. The emission, hotter than its surroundings, drifted NW and quickly dissipated. The USGS stated that a crew from a NOAA ship working at Pagan observed continuous steam emissions from the N crater during 21-22 April. Satellite imagery analyzed by the Washington VAAC showed a diffuse plume drifting 15 km W on 23 April. On 28 April, steam emissions had decreased so the Aviation Color Code and the Volcano Alert Level were lowered to "Unassigned." There are no monitoring instruments on Pagan, thus the levels "Green" or "Normal" do not apply because background activity is not defined. Monitoring is done by satellite and ground observers. Based on reports from the Washington VAAC, the USGS stated that on 15 April intermittent plumes of steam from Pagan rose to an altitude of 1.8 km (6,000 ft) a.s.l. and drifted 37 km W. Observers on a ship reported that a white plume "with some black" rose 1.8 km (5,700 ft) from the volcano. On 16 April a diffuse plume drifted 85 km W. USGS raised the Aviation Color Code to Yellow and the Volcano Alert Level to Advisory. The next day fishermen again reported a plume. During 4-5 December, residents 3 km SW of Pagan reported ashfall that accumulated in their camp at a rate of about 6.4 mm per day. They also described a plume from the summit that rose to an altitude of 640 m (2,100 ft) a.s.l. and a sulfur smell that occasionally wafted through their camp. Based on satellite imagery, the Washington VAAC reported a gas-and-ash plume that drifted mainly W on 5, 6, and 8 December. Satellite imagery showed no further activity through 11 December. A strong explosive eruption from North Pagan . . . began on 15 May. While reporting strong felt seismicity on the island, radio operator Pedro Castro suddenly announced at 0915 that the volcano was erupting. Communication was then cut off. An infrared image from the GMS at 1000 showed a very bright circular cloud about 80 km in diameter over the volcano. The cloud spread SE at about 70 km/hour, and by 1600 its maximum height was estimated at 13.5 km from satellite imagery. Weakening of activity was evident on the image returned at 1900, and on the next image, at 2200, feeding of the eruption cloud had stopped, with the proximal end of the cloud located about 120 km SE of the volcano. No additional activity has been detected on satellite images, but by 0400 the next morning, remnants of the plume had reached 10°N and 155°E. 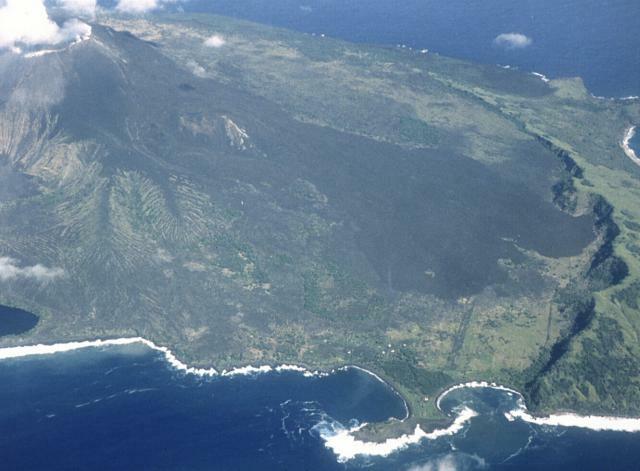 Aircraft attempting to land on Pagan Island were prevented from doing so by the eruption. At 1235, pilots reported a mushroom cloud over the island and ashfall over its N and E ends. Ashfalls were also reported from Agrigan Island, 105 km NW. Additional pilot reports at 1410 indicated that the eruption was intensifying and that the cloud had reached more than 7 km altitude. UPI reported that aircraft crews flying past the island at two different (but unspecified) times saw ash rising to 10.5 and 18 km. The USN reported that aircraft crews saw lava flowing down the NE and NW flanks toward the sea, and about 2.5 km down the SW flank to within 1 km of the island's village and 0.5 km of the airstrip. The Japanese merchant ship Hoyo Maru rescued all 53 persons on Pagan Island early 16 May. Only one minor injury was reported. The USGS sent a 3-man team from the HVO to Pagan Island. When they overflew the island on 17 May at about 1200, the eruption had ended. Lava had advanced about 1 km down the NE and NW flanks from the summit. The SW flank flow had partially covered the airstrip, but had stopped before reaching the village. Information Contacts: F. Smigielski, NOAA/NESS; G. Telegadas, NOAA/Air Resources Lab (ARL); R. Tilling, USGS, Reston, VA; U.S. DOD; UPI. A USGS team of Norman Banks, Robert Koyanagi, and Kenneth Honma carried out ground observations, seismic monitoring, and deformation studies on Pagan Island 20-28 May. The material in quotes is excerpted from their report. Material not between quote marks was abstracted from their tabular data. "A major eruption of North Pagan started 15 May, preceded by earthquakes first felt in late March or early April. The earthquakes (approximately 3/day) were strong enough to shake houses, and some were felt by persons out of doors; magnitudes were probably between 3 and 4. One resident visited the summit area 13 May and noted new ground cracks, sublimates, and increased gas emissions. "On 15 May, the first of a series of closely-spaced earthquakes (at least 13 felt) began at 0745 and from descriptions of cracked concrete houses, one of the earthquakes (at 0825) probably exceeded magnitude 4. At 0915, residents heard a loud boom, followed immediately by the beginning of the eruption, first on the N flank then proceeding toward the S part of the summit area. The eruption apparently reached full intensity almost immediately, and lava flows were noted by residents very soon after the appearance of the ash/scoria column. Geologic observations show that ash eruption and lava emission took place simultaneously during most of the eruption. "Airline and rescue pilots reported that the height of the eruption cloud exceeded 13 km, and Japan-based weather radar reported ash to heights of 18-20 km. Weather satellite images showed that the high-altitude ash cloud traveled SSE (6:4), but ash and scoria deposits on Pagan Island were thickest in the NW sector because of the prevailing SE winds at low altitude." At 1930 there was a notable decrease in plume height and density. Activity remained weak the next day except for a brief period of vigorous ash ejection reported by the USN around noon. During an overflight between 1000 and 1030 on 18 May, only weak to moderate emission of blue fume was noted. Residents of Alamagan Island, 35 km SSE, reported "fire and smoke on the mountain" 19 May. "Three vents, oriented about N-S, were active. The northernmost vent, about 1 km N of the summit, was probably the first to open; it built a scoria/ash cinder cone about 80 m high, 0.90 km2 in area, and about 36 x 106 m3 (or 12 x 106 m3 of magma, recalculated to a density of 3 g/cm3) in volume (figure 1). The central vent was in a notch about 100 m deep in the N rim of the old summit crater. This vent probably ejected most of the material in the large eruption cloud, and it fed flows that went N, NNE, and W. The third and southernmost vent was in a notch about 80 m deep in the S rim of the old summit. This vent fed flows that moved S."
Figure 1. Sketch map of Pagan showing distribution of the 15 May 1981 eruption products. Courtesy of the USGS. The USGS team observed intermittent activity during 8 days of field work on Pagan Island. An increase in harmonic tremor level and the number of discrete higher frequency events began 1-2 hours before the extrusion of minor aa lava flows from the S summit vent late 21-early 22 May, and late 23 May. A similar increase in seismicity during the midmorning of 24 May was followed by ash emission from both the N and S summit vents that lasted from early afternoon through the evening. As ash emission was decreasing during the evening of 24 May, extrusion of a small amount of aa lava occurred; lava extrusion also occurred during the evening and predawn hours of 25 and 26 May. Eruptive activity was then limited to minor fuming until USGS personnel left Pagan Island 28 May. "The volume of eruptive products ejected through 28 May exceeded 50 x 106 m3, and a large part of the island's arable land was covered by lava flows, and airfall ash and scoria. Lava flows were predominantly aa and ranged from 3 to 30 m in thickness. Fortunately, extremely devastating phenomena such as widespread pyroclastic flows did not take place. Lithic blocks and juvenile bombs as large as 1 m in diameter were thrown more than 2 km from the summit onto the N flank, and base surge phenomena, evidenced by low-amplitude (4-20 cm) dune and antidune features and preferential upslope tree damage, took place in restricted corridors down to elevations of 200 m on the N and S slopes. "The events of 15 May caused no injuries to residents, but some livestock were killed outright, and others were starving because of extensive destruction of vegetation. However, the present breaches on the N and S rims of the crater could channel potentially destructive pyroclastic flows into narrow corridors N and S of the summit. Such channeling may have occurred on 15 May and could occur again, even during the current eruptive cycle. "Ash and scoria deposits on the island, constituted about 4 x 106 m3 of magma (recalculated to a density of 3 g/cm3) and exceeded 2 m in thickness NW of the summit crater. An unknown volume of ash and scoria was deposited at sea and composed the ash plume that extended S of Guam. The longest lava flow (2.8 km), that issued from the S vent covered 2.5 km2 and had a volume of about 15 x 106 m3. The N summit vent fed flows (1 km long, 0.2 km2 area, 1.0 x 106 m3 volume) that spilled over the summit crater on the W and stopped 100 m short of the inner lagoon; it also fed very voluminous flows that advanced N, dissecting and carrying away much of the material in the cinder cone around the vent on the N flank. The NE lobe of these northern flows traveled 1.5 km, covered an area of about 0.2 km2, and contained 2 x 106 m3 of lava. The N lobe traveled 3.5 km, locally exceeded 30 m in thickness, covered an area of about 1.3 km2, and had a volume of about 25 x 106 m3. The several lava flow and ash-ejecting events after 15 May were all of minor volume. "Six gas samples were collected from four cracks that opened during the 15 May eruption, and 1 sample of airfall scoria was fused and analyzed by electron microprobe by John Sinton (University of Hawaii). Preliminary analyses of the gas samples by Paul Greenland (HVO) suggest that they contain a large portion of air (mostly introduced into the vent system through the porous volcanic edifice). When compared with gases of Kilauea (Hawaii) and Mt. St. Helens (Washington), the Pagan gas had low amounts of SO2 and high amounts of H2, CO, CH4, and COS. The scoria sample was more or less typical of basalt of northern Marianas volcanoes (table 1). Hand-specimen examination indicates that the 1981 basalt contains few (1-7%) phenocrysts (1-2 mm long) that are dominantly plagioclase and clinopyroxene. Table 1. Chemical analyses of Pagan samples. 1981 values are from microprobe analyses of a fused sample by John Sinton, University of Hawaii; the analyses of 1925 flows are from Larson and others (1975). "A tilt monitor was established 21 May on the inner lagoon to measure possible changes of lake level around the shoreline and tilt of the lakebed. During the 8-day monitoring period, the lake level dropped regularly at a rate of about 24 mm/day, either because of tidal changes, slow drainage of the lake, water evaporation, or uplift of that part of the island. Continued drainage of the lake or increases in temperature of the lake water would cause concern, because such changes could indicate that ground water might be heating in response to the proximity of hot rock in the volcanic edifice. The overall trend of the tilt changes observed can be interpreted in terms of a possible inflation center NE of the lake near the N flank vent. In addition, fluctuations took place that could either be measurement noise or, if real, be associated with the largest eruptive events during our residence on the island (24 May ash event and 25 May lava event). "A segmented EDM array was installed on the S flank as an additional deformation monitor. In general, changes above "noise" level were not seen in the lines measured from the instrument (INS, figure 1) to the three nearest stations, but station TOP (at elevation 540 m) moved steadily southward, 66 mm in 6 days. This movement could have resulted from inflation of the summit due to intrusion of a shallow magma body, gravitational instability of the summit area, or right-lateral movement on the N-S fissure system that formed during the eruption. "Seismic monitoring 20-28 May showed continuous harmonic tremor indicating movement of magma a few kilometers beneath the surface, and short bursts of high-frequency signals, indicating intermittent extrusive events such as degassing and low-level lava fountaining. The ongoing harmonic tremor suggests that more secondary eruptive activity may take place. "At the same time, no significant earthquake activity was detected, indicating no prominent buildup of stresses typically associated with activities prior to a major explosive eruption. However, the deformation survey indicated possible swelling of the volcano, which may lead to an increase in future microearthquake activity and eventually to an eruptive event more significant than those of 20-28 May." Reference. Larson, E.E., Reynolds, R.L., Merrill, R., Levi, S., and Ozima, M., 1975, Major-element petrochemistry of some extrusive rocks from the volcanically active Mariana Islands: BV, v. 38, p. 361-377. Further References. Banks, N.G., Koyanagi, R.Y., Sinton, J.M., and Honma, K.T., 1984, The eruption of Mt. Pagan volcano, Mariana Islands, 15 May 1981: JVGR, v. 22, p. 225-270. Sawada, Y., 1983, Analysis of eruption clouds by the 1981 eruptions of Alaid and Pagan volcanoes with GMS images: Papers in Meteorology and Geophysics, v. 34, p. 307-324. Information Contacts: N. Banks, R. Koyanagi, and K. Honma, HVO. Residents of Alamagan Island, [roughly 60 km] SSE of Pagan, observed mild ash ejection and "fire and smoke" emerging from the volcano around 11 June. No additional activity has been reported. Information Contacts: N. Banks, HVO. "Overflights of Pagan by the USN on 16 July and the USGS on 12 September revealed the formation of a new 60-80-m-diameter crater in the center of the old summit crater. Fume emission rates from the new vent appeared to be significantly greater than the combined rate observed in late May from the three vents formed 15 May. However, no new lava flows were identified and ash accumulation downwind of the new vent was not appreciable. The new vent may have formed during the explosive activity observed from a nearby island 11 June. Residents of Pagan Island . . . returned for a 1-day visit on 19 November. Explosive activity was occurring when they arrived about 0600 and continued through the day, accompanied by booming sounds. Scoria fell on the visitors, who also noted a strong odor of sulfur. At about 1700, a series of booming sounds was followed by ejection of a tephra column that rose about 1.5 km. Since a previous visit in September, 1 cm of ash had accumulated on the island's only village, 4 km from the summit. Residents of Agrigan Island, about 50 km NNW of Pagan, observed voluminous black columns rising from the volcano on 4, 5, and 6 January, and white plumes on other days in the first half of January. Telefax copies of thermal infrared imagery (8 km resolution), available at 3-hour intervals from the GMS were inspected at the NOAA/NESS, but no eruption cloud was apparent despite clear weather. The activity was preceded by three deep earthquakes near Pagan, on 3 January at 2005, 2009, and 2015. NEIS located preliminary hypocenters at 18.034°N, 145.633°E, 590 km deep (M 6.1); 17.903°N, 145.530°E, 513 km deep (M 5.8); and 18.166°N, 145.352°E, 596 km deep (M 5.4). The first event was felt on Saipan (about 180 km S of Pagan) and Guam (nearly 300 km SSW of Pagan). No additional activity was reported until 8 February, when the mayor of the northern islands visited Pagan and found it erupting. A minimum of five minor eruptions per day were observed through 23 February. At one point during this period (date and time not yet determined), a "large smoke cover" from Pagan was observed over Saipan. Images of the area, returned by the NOAA 7 polar orbiting satellite 1-2 times per day, were inspected 25 January-25 February, but no eruption plumes were evident. In hand specimen, a sample of ejecta collected 17 February appeared to contain at least 30% non-juvenile material. The sample will be analyzed at HVO. The 53 residents of Pagan, evacuated during the second day of the 1981 eruption, have not yet been able to return for more than brief visits to the island. Information Contacts: N. Banks, HVO; Cmdr. J. Walker, COMNAVMAR; L. Whitney, Office of the Rep. to the U.S., Washington DC; USGS/NEIS, Denver CO; M. Matson, NOAA/NESS. 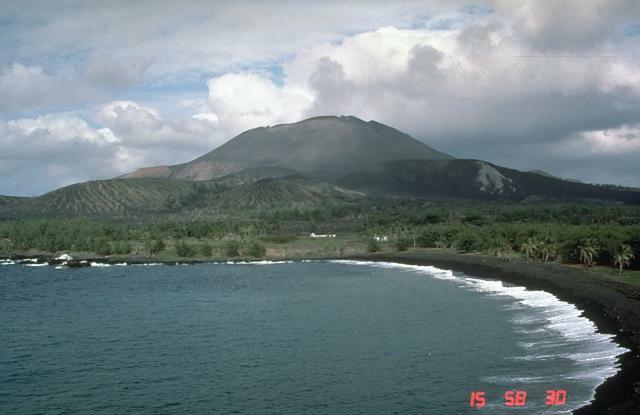 Personnel on a USN training flight observed activity at Pagan when they flew near the volcano about 1415 on 10 December. A hole roughly 60 m below the crater rim on the NW side was spewing debris and brown smoke. Light-colored vapor was emerging from the center of the crater. Burning was seen along the S and SW slopes, but a cause could not be determined [see 8:3]. Information Contacts: Cmdr. J. Walker and Lt. J. Meyer, COMNAVMAR. "A team of four HVO scientists, five scientists from the USGS Water Resources Division, plus Civil Defense and other government officials from the Commonwealth of the North Mariana Islands visited Pagan 5-15 March. "There were two very minor ash eruptions on 7 and 15 March; ashfall was confined to the summit cone. During the remainder of the visit, activity was limited to degassing. The gases were essentially atmospheric in composition, much different than the May 1981 gases, which had a high magmatic component. Seismic monitors showed varying amounts of B-type events and harmonic tremor. More numerous and stronger seismic events preceded the ash eruptions of 7 and 15 March. "HVO scientists established a second EDM array (one had been installed in May 1981) and a tilt network, and installed a seismic event counter and two-component tiltmeter. Both EDM arrays showed minor deflation 5-15 March. Reoccupation of the original EDM line showed that 25 cm of net inflation had occurred on the higher slopes of the volcano between May 1981 and March 1983, but the lack of other measurements between those dates prevented determination of shorter-term deformation trends. "Scientists from the Water Resources Division installed equipment to transmit data from the two-component tiltmeter (including periodic temperature measurements), the seismic event counter, and a rain gauge to Hawaii via the GOES West satellite. They also performed a water resource evaluation and sampled volcanic gases. "Stratigraphy of the tephra deposits indicated that Pagan had erupted at least four and perhaps as many as seven times since May 1981. The volume of the post-May 1981 tephra deposits is minor in comparison to that of the May 1981 deposit. It is difficult to assign eruption dates to each tephra layer because of the sporadic nature of observations on the island. However, it is probable that a single lava flow and one of the tephra layers was produced on 11 June, 1981 (6:6). Other eruptions were observed in November 1981 (6:11) and January through February 1982 (7:2). The date of emplacement of the uppermost and thickest tephra layers is uncertain. However, comparison of December 1982 aerial photographs with those taken in August 1982 suggested that these layers were emplaced during that interval. 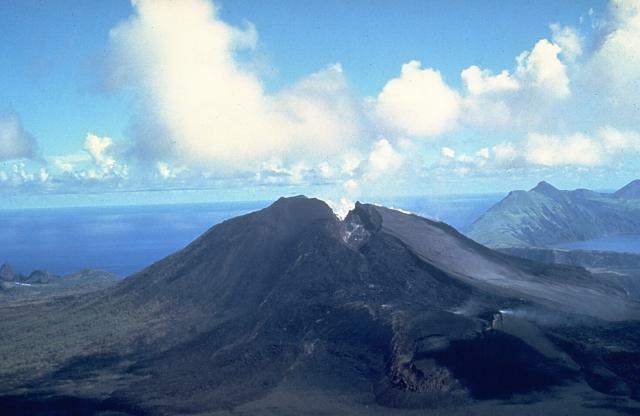 In addition, during late September-October 1982, residents of Saipan (roughly 300 km to the S) reported a dark cloud, similar to the one ejected in May 1981, drifting to the S.
"The most recent eruptive products were slightly richer in phenocrysts than products of the May 1981 eruption. 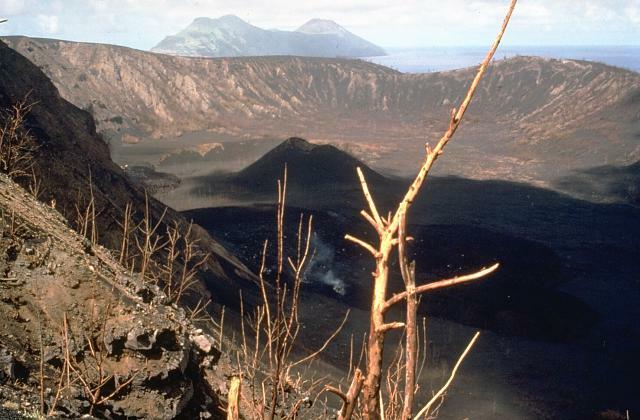 A preliminary microprobe analysis indicated that February 1982 eruption material was less differentiated than that of May 1981 but similar in composition to the 1925 magma (6:6). "The activity seen by USN personnel on 10 December 1982 was much less intense than that of March 1983. The burning seen along the S and SW slopes was on another edifice on the opposite (S) end of the island, and was due to a brush fire, unrelated to eruptive activity. On 1 September, personnel aboard a Continental Air Micronesia aircraft flying from Saipan to Japan reported "ash and smoke" at an altitude of 6 km within 15 km of the volcano. Scheduled flights pass directly over Pagan Island 1-2 times per day, but no subsequent flights reported increased activity. No eruption clouds were observed on satellite imagery. Technicians visited Pagan in late July, and saw only minor activity. Inspection of a checkpoint near the volcano on 29 July revealed no indication of major new ashfall since geologists left the island in mid-March. Pagan Island remains uninhabited, as it has since the major eruption of May 1981 (6:4-5), although residents and officials occasionally visit the island. Pagan's mayor, on the island through late August, observed no change from the low-level late July activity. Information Contacts: R. Shaw, IATA, Montreal; R. Koyanagi, HVO; F. Chong, Disaster Control Officer, Saipan; O. Karst, NOAA/NESDIS. On 8 and 9 September USN personnel observed the volcano during pilot-navigation training flights. They described (and photographed) a plume containing a little ash that issued gently from the crater. Although heavy rain, lightning and convective weather cloud activity to more than 9 km obscured the view on the 8th, the plume was seen rising to 3.4 km. A stratus layer extended 30-35 km ENE at 2-2.5 km altitude. In clear conditions on the 9th, the rising plume and the stratus layer were again observed. Information Contacts: Lt. Cmdr. R. Adkerson, COMNAVMARIANAS. Several former residents of Pagan, including Mayor Dan Castro, spent September on the island. The only activity they observed was an explosive eruption accompanied by glow that began at 0640 on the 26th. That evening, glow remained visible. Ash that fell on the village was collected from concrete slabs. The ash has been identified as magmatic, of medium-sand size, and depleted in fines. Since Pagan's major eruption in May 1981, six or seven explosions have ejected enough tephra to cause ashfall in the village. The 26 September ash was the first to fall on the concrete slabs since they were swept clean in July. Visible images from NOAA 7 and NOAA 8 polar-orbiting satellites showed Pagan emitting a small, moisture-laden plume on about half of the days between 29 March and 8 May ([on 29 and 31 March; 1,2,3,4,5,6,8,11,12,14,20,21,23,24,25, and 28 April (weather clouds on 17-19 April); and 1 and 7 May]). When present, the plume extended 100-160 km downwind, with its base at about 0.75 km and its top at about 1.8 km. Occasionally the plume appeared as a haze, when its moisture had been lost downwind. Whether the moisture in the plume was vented by the volcano or acquired from the atmosphere has not been determined. On 15 May, Pagan erupted twice. At 0825 residents of Agrigan Island, 65 km N, felt an earthquake, rushed from their homes, and saw a dark column rising 2-4 km above Pagan. The eruption cloud, about 50 km in diameter, drifted NW. An Air Force weather reconnaissance plane, diverted to inspect the activity, observed no lava emission. A second moderate eruption occured during the afternoon. Information Contacts: M. Matson, NOAA/NESDIS; N. Banks, HVO. The crew of a Continental Air Micronesia flight that passed about 25 km W of Pagan at about 6 km altitude on 11 April at 0840 observed a large brown ash cloud obscuring the volcano. The eruption column rose to about 2.5 km altitude and a plume extended about 150 km to the W. On 15 April at 1400, another Continental Air Micronesia flight passed over Pagan and the crew reported a new lava flow. Information on its size and position were not available. On 1 May at about 1000, Space Shuttle astronauts took nine photographs that showed a plume originating from near the center of the volcano and extending at least  km to the SSW (figure 2). The plume was dense near the volcano and appeared to contain some ash, but diffused rapidly as distance from Pagan increased. Weather clouds obscured the volcano during subsequent orbits. Figure 2. Space shuttle photograph (no. 51B-146-030), taken 1 May 1985, showing a plume extending at least 100 km SSW from Pagan. Alamagan, Pagan's neighbor to the SSE, is also shown. Courtesy of C. Wood. Information Contacts: N. Banks, HVO; R. D. Morris, Continental Air Micronesia, Guam; W. Dailey and C. Wood, NASA, Houston, TX. L.G. Eldredge visited Pagan for a few hours on 4 June. The only visible activity was steam emission from the crater. Scoria from the 1981 eruption appeared to have become a slurry-like material during the past 3 years, flowing into the village where it had filled rooms at the infirmary and reached almost to the roof of the school. The 6 September edition of the Guam Sunday News included a photograph that showed a moderately dense cloud rising perhaps 1 km from the summit of Pagan during what was described as an eruption in the morning of 4 September. Information Contacts: L. Eldredge, Univ of Guam. Mid-February eruptive activity at Pagan may have been the source of an unusual haze that affected Saipan Island, 300 km to the S, but little information is yet available. A weather bulletin released 16 February at 2000 had reported an eruption on nearby Agrigan Island. However, a Civil Defense overflight detected no signs that an eruption had occurred there, and newspapers attributed the activity to Pagan. Satellite images on 16 February revealed no plume, despite clear weather. Seismographs that usually monitor Pagan's activity were being repaired. Information Contacts: R. Walter, NOAA/NESDIS; J. Eldredge, Guam. A warning to aircraft (SIGMET) issued early 26 August reports that an ash cloud from Pagan was observed near 18.2°N, 145.8°E on 25 August at 1015. The ash cloud extended 110 km NW. Its height was unknown but was believed to be less than 3 km. No other reports of activity were received. Information Contacts: D. Subera, US Dept of Interior; N. Banks, CVO. Satellites provided additional plume heights and lengths 24-25 August (table 2). A press report described an ash eruption that began suddenly on 11 October at 0930. The ash cloud was about 3 km high and extended roughly 40 km. Table 2. Satellite-derived estimates of altitudes, lengths, and azimuths of plumes from Pagan, August 1988. Courtesy of NOAA/NESDIS. Information Contacts: M. Matson, NOAA; N. Banks, CVO; Marianas Variety. On 12 October at 1050, a U.S. Air Force pilot noted a plume that extended 1.5-7.5 km at <1 km altitude. The plume was not evident on satellite images. Information Contacts: M. Matson, NOAA. Fieldwork was conducted . . . 28 September-3 October . . . . A regional network of single vertical-component, short-period seismometers was installed, with instruments located on the islands of Pagan, Alamagan, and Anatahan, and a receiving station on Saipan. . . .
Information Contacts: R. Koyanagi, HVO. A seven-member team of USGS volcanologists visited the CNMI 24 September-6 October at the request of the Office of Civil Defense. The team installed [a seismic station on] Pagan; data are telemetered to Saipan and recorded at Civil Defense headquarters. Quoted material below is from a report by Richard Moore. "Remeasurements of the distances between two permanent glass reflectors installed in 1983 on the SW flank showed no significant changes in line lengths since 1984. Seismic data telemetered to Saipan showed no significant earthquake activity on Pagan after installation of the station in early October. Most of the abandoned village has been destroyed by alluvial debris derived from 1981 and younger rocks. Eruptions less vigorous than that of 15 May 1981 occurred intermittently from late May 1981 until October 1988. The USGS team observed a prominent SO2-bearing plume emitted from Pagan 28 September-3 October." Information Contacts: R. Moore, USGS; R. Koyanagi and M. Sako, HVO. A six-member team of USGS volcanologists visited the Commonwealth of the Northern Mariana Islands 11-27 May 1992 at the request of the CNMI Office of Civil Defense. The team observed all of the islands in the chain N of Saipan, installed a new seismic station at the base of frequently active Pagan, remeasured existing EDM networks, mapped the geology of Alamagan, sampled fumaroles and hot springs, and collected rocks and charcoal for radiocarbon dating. No volcanoes in the chain erupted during the observation period. Reports from brief visits to Pagan indicate that the most recent small ash eruption occurred on 13 April. Continuing seismicity was dominated by short bursts of long-period earthquakes and volcanic tremor. The highest measured steam temperature was 76°C; solfataras that are probably hotter are inaccessible deep within the crater. Episodic fuming, marked by periods of relatively high SO2 outgassing followed by quiescence, was observed continuously 13-21 May. EDM lines from the coast to reflectors on the flanks had shortened by as much as 11.3 cm since September 1990. These lines had shown no significant changes between 1983 and 1990, a period characterized by frequent small ash eruptions following the large Plinian eruption of 15 May 1981 (Banks and others, 1984). After the first remeasurement on 17 May, no large changes in line lengths were detected during the next 3 days. The team collected three charcoal samples on Pagan. Two of the units to be dated are relatively old, and their ages should help to constrain the age of the caldera. South Pagan . . . has several steaming fumaroles, but no temperatures were measured. No shallow earthquake swarms have been recorded since the installation of the seismic station in 1990. Reference. Banks, N.G., Koyanagi, R.Y., Sinton, J.M., and Honma, K.T., 1984, The eruption of Mount Pagan volcano, Mariana Islands, 15 May 1981: JVGR, v. 22, p. 225-269. The number of reports of ash columns above North Pagan . . . has increased since the beginning of the year. A 168-km-deep Benioff-zone earthquake (Mb 5.7) occurred at 0118 GMT on 18 January with an epicentral location (18.38°N, 145.71°E) ~40 km N of Pagan. In January 1982, three earthquakes, 500-600 km deep, in the vicinity of Pagan preceded eruptive activity (8:2), and it is speculated that the January 1993 event affected the behavior of the volcano. Columns rising to 2,000 m above the summit were observed in mid-January and on 17 March. It is thought that other, unobserved eruptive events have also occurred. A distinct change in seismic activity took place on about 13 February. Before then, the seismicity consisted of 12-24 long-period events/day, each lasting 30-60 seconds. The dominant frequency of the events was 2-5 Hz and their amplitude was 2-3x background. Occasional small ash columns to 30 m were observed. Since mid-February, there have been frequent reports of intermittent ash eruptions, and banded tremor has been recorded at 10x background levels. The tremor episodes last 30 minutes to an hour, and are separated by 1-2 hour intervals of relative quiet. Though battery problems at the solar-powered seismic station prevent recording of activity when there is insufficient sunlight, the banded tremor has been consistently recorded when the station was functioning. It is speculated that the frequent ash emissions are associated with the tremor episodes. Information Contacts: R. Koyanagi, HVO; R. Chong, Disaster Control Office, Saipan; R. Moore, USGS. The emergency declaration of 15 March, putting Pagan Island off-limits to all visitors, boaters, and airmen, was extended on 2 June (until further notice) because of continued volcanic activity. Characteristic daily seismicity in May and early June indicated continued intermittent ash ejections from North Pagan, the larger of the two strato-volcanoes on the island. Eruption columns to 2 km have been reported by aircraft. Intermittent ash eruptions were accompanied by a change in seismicity in mid-February (18:3). Increased levels of banded tremor in March were thought to be associated with frequent ash emissions. Columns rising to 2 km were observed in mid-January and 17 March. Information Contacts: R. Koyanagi, HVO; R. Chong, Disaster Control Office, Saipan. Eruptive activity from the summit crater continued at North Pagan in June and July with ejection of tephra columns to heights of several kilometers. Eruptive pulses, 30-60 minutes long, were occurring several times each day during this period. Activity declined in late July, and had not increased again as of early September. There have been no reports of lava flows, but several lahars have descended the SE flank of the cone. Most morphological changes observed in early September resulted from these continuing lahars. Seismicity was also at a low level in early September. Information Contacts: D. Shackelford, Fullerton, CA; R. Chong, Disaster Control Office, Saipan. Pagan's behavior has been the subject of a recent study addressing local and regional seismicity, instrumentation, eruption dynamics, and a means of possibly increasing the safety of visiting the island (Koyanagi and others, 1993). The study reached the following conclusions: 1) Pagan exhibited an active "open vent" state (with obvious hazard implications), 2) Ash eruptions, which occur frequently at Pagan, were revealed seismically by volcanic tremor, and 3) Tremor amplitude and duration appeared roughly proportional to the height and duration of the ash eruption. The Pagan seismograph (PAGV, figure 3) is installed in a thick, concrete World War II bunker that helps absorb noise. Its signal is radio-relayed sequentially with those from three other stations to the Emergency Operation Center in Saipan (305 km S) for continuous recording. The system has operated since July 1992. Figure 3. Map of Pagan Island showing the locations of volcanic cones and the permanent seismometer (PAGV). Observations on 14-17 November 1993 were also made from the site of the portable seismometer near the airstrip (OBS) and the campsite (Camp). On the original map North Pagan was labeled Mt. Pagan (Koyanagi and others, 1993). In the latter half of 1992 low-frequency earthquakes dominated; these events indicated internal instability of the volcano without surface eruptions. In late 1992 and early 1993, longer bursts of tremor sustained for 5 minutes to more than an hour became increasingly common. On 18 January 1993 a moderate M 5.7 earthquake occurred deep beneath the Pagan area. During the subsequent months (first half of 1993), 30-60-minute bursts of tremor persisted at semi-regular intervals, alternating with low-amplitude tremor lasting several hours. The bursts occasionally reached amplitudes of 20x background; during a few bursts visitors reported moderate ash eruptions. This type of tremor is sometimes called banded tremor. The name comes from the alternating pattern of high and low amplitudes written on a revolving-drum seismograph (figure 4). Figure 4. Seismogram of banded tremor associated with intermittent Pagan ash emissions. Recorded on station PAGV, 12 June 1993; no scale indicated (after Koyanagi and others, 1993). In the interval June-August 1993 tremor level decreased to occasional bursts of long-period events; also, high background signals were caused by heavy surf and stormy sea conditions. Since mid-1993 there have been short bursts of tremor <30 minutes in duration at variable intervals and with amplitudes <10x background. Given the absence of microearthquakes this tremor activity suggests continued minor volcanic activity. A campsite was established 14-17 November 1993 (figure 3). Observations were made from the campsite and from the W end of the airstrip where a portable seismograph was operated. The visiting team included the principal observers and instrument specialists, George Kojima (USGS), Ramon Chong (CNMI), and Robert Koyanagi (USGS), with logistical support from four other members of the CNMI Office of Disaster Control. In the first two days, researchers frequently observed seismic tremor with amplitudes of 5-10 mm lasting from 5 minutes to >30 minutes. In the next two days, amplitudes and number of episodes decreased. Figure 5 shows one typical example of tremor and associated ash eruptions (taken on 16 November). Koyanagi and others (1993) documented several other similar cases as well. Figure 5. Comparison of tremor amplitude and explosive plume height for one eruptive sequence (Koyanagi and others, 1993). Registered at station PAGV during the interval 1111-1215, 16 November 1993. Top: An example of the seismic record of tremor, with notes describing the peak-to-peak amplitudes and the early stages of the eruptive sequence. Flags numbered a and b correspond to images shown below. Seismic record is not at original scale of Koyanagi and others (1993). Middle: Diagrams of the early-middle phases of a small eruption at Pagan. The diagrams were based on color photographs and illustrate the development of the plume and the associated height measurements. Diagram d represents the maximum plume height (plume bent toward viewer, top not shown). The plume heights were estimated from geometry by workers in the field. The heights shown are approximate, they were reconstructed from the plot below. Bottom: Plot showing peak-to-peak tremor amplitude and explosive plume height versus time. The arrow refers to the on-site observation of the eruption onset. Activity typically followed this sequence: a) Seismic tremor started, b) White volcanic gases and steam were emitted 1-3 minutes after the onset of tremor, ash came out about a minute later, c) Tremor amplitude typically peaked several minutes after tremor onset, d) The ash plume spread and rose up to 1-2 km above the summit about 5 minutes after ash outbreak, and e) Ash fell at the campsite about 10 minutes after ash outbreak. Winds were generally low during the survey, but occasional changes affected the height and configuration of the ash column and direction of ashfall. During the observation period, tremor amplitude and duration seemed roughly proportional to the height and duration of the ash eruption. Times and amplitudes of seismic tremor were recorded using a portable revolving-drum seismograph. The seismic records were later verified with the signals telemetered to Saipan from the permanent station. Given the correlation between tremor and ash eruptions, the continuously recording seismograph provides both an indirect, unbroken documentation of the volcano's eruptive behavior, and a way to make short-term forecasts of eruptive episodes to improve the safety of visits to the island. Reference. Koyanagi, R., Kojima, G., Chong, F., and Chong, R., 1993, Seismic monitoring of earthquakes and volcanoes in the Northern Mariana Islands: 1993 summary report: Prepared for the Office of the Governor, Commonwealth of the Northern Mariana Islands, Capitol Hill, Saipan MP 96950 (revised 21 February 1993), 34 p.
At 1800 on 4 December 2006 scientists from the Hawaiian Volcano Observatory (HVO) and Emergency management Office (EMO) were advised by Pagan residents of ashfall at their camp. They continued to report light ashfall (through an unreported date), with up to a centimeter per day accumulating 3 km SW of the summit and a plume rising about 60 m above the vent. There were no felt earthquakes or noise from the volcano, but occasional sulfur smells wafted through the camp. Visible satellite imagery interpreted by the Washington VAAC showed a small gas plume, possibly with minor ash, at 0733 on 5 December. Cloud cover made satellite observations difficult, but during 5-6 December plumes could be distinguished extending as far as 185 km W. A Terra MODIS image on 6 December (figure 6) showed the plume near the island to be light brown in color, indicating ash content. A serpentine-shaped plume at 0833 on 7 December extended 140 km WSW from the island. Later that day, at 1300, a faint narrow plume could still be seen to a distance of about 300 km W. The last visible imagery that showed an ash plume was at 1633 on 8 December; the plume was very narrow and at low altitudes. Figure 6. Terra MODIS image showing a light brown ash plume blowing W from Pagan, 6 December 2006. Courtesy of NASA Earth Observatory and the MODIS Rapid Response Team at Goddard Space Flight Center. Although significant eruptive activity seemed to have ended on 8 December, observations from the International Space Station revealed a plume on 11 January 2007 (figure 7). The very diffuse plume was most likely steam. There were no reports of ash plumes from the island or warnings to aviators based on satellite data after 8 December 2006. Figure 7. Photograph showing a thin plume extending SW from Pagan on 11 January 2007. [Astronaut photograph ISS014-E-11872 was acquired with a Kodak 760C digital camera using a 180 mm lens.] Courtesy of NASA Earth Observatory, the ISS Crew Earth Observations experiment, and the Image Science & Analysis Laboratory, Johnson Space Center. Eruption during 1993-94. The eruption that began around mid-January 1993 (BGVN 18:03) continued through at least 30 April 1994 (figure 8). Fieldwork by USGS and EMO scientists during April and May 1994 was not previously reported in the Bulletin. Trusdell and others (2006) noted that following the eruption in 1981 (SEAN 06:04), "Intermittent light ejection of chiefly phreatic ash continued until 1996, with maximum post-1981 accumulation estimated at as much as 1-2 m on the source cone." Figure 8. Ash plume erupting from Pagan, 30 April 1994. View is to the S. Courtesy of Frank Trusdell, USGS. References. Sako, M.K., Trusdell, F.A., Koyanagi, R.Y., Kojima, G., and Moore, R.B., 1995, Volcanic investigations in the Commonwealth of the Northern Mariana islands, April to May 1994: U. S. Geological Survey Open-File Report 94-705, 57 p.
Trusdell, F.A., Moore, R.B., and Sako, M.K., 2006, Preliminary geologic map of Mount Pagan volcano, Pagan Island, Commonwealth of the Northern Mariana Islands: U. S. Geological Survey Open-File Report 2006-1386, 32 p.
Information Contacts: Emergency Management Office of the Commonwealth of the Northern Mariana Islands (EMO-CNMI), PO Box 100007, Saipan, MP 96950, USA (URL: http://www.cnmihsem.gov.mp/); U.S. Geological Survey, Hawaiian Volcano Observatory (HVO), PO Box 51, Hawaii National Park, HI 96718, USA (URL: https://volcanoes.usgs.gov/nmi/activity/); NASA Earth Observatory (URL: http://earthobservatory.nasa.gov/). Our most recent report on Pagan (BGVN 32:01) covered light ashfall and a small gas plume probably containing some ash during the first week of December 2006. We received no additional information regarding activity at Pagan until April 2009. The U.S. Geological Survey (USGS) does not currently have monitoring instruments on Pagan. Monitoring is by satellite and ground observers. According to the Washington Volcanic Ash Advisory Center (VAAC), a plume from Pagan on 15 April consisting of intermittent puffs of steam rose to an altitude of 1.8 km and drifted about 37 km W. This observation was confirmed by a ship crew that noted a white plume "with some black" that same day. On 16 April, the Washington VAAC reported that a narrow plume of unknown composition extended 85 km W from the volcano. According to the CNMI Emergency Management Office, fishermen reported that the plume was "thicker" on 15 April than on 16 April. Weather clouds obscured satellite views. The next day fishermen again reported a plume. By 17 April, steaming had diminished. A passing pilot reported seeing no activity; however, the Washington VAAC noted a very faint plume extending 85 km NNW in satellite imagery. Crew on a U.S. National Oceanic and Atmospheric Administration (NOAA) ship observed continuous emissions from the N crater during 21-22 April. Satellite imagery analyzed by the Washington VAAC showed a diffuse plume drifting 15 km W on 23 April. On 28 April, steam emissions had decreased. No thermal hotspots on Pagan have been detected by MODIS during the last five years. Information Contacts: Dina Venezky, Volcano Hazards Program, U.S. Geological Survey, 345 Middlefield Road, MS 910, Menlo Park, CA 94025, USA (URL: http://volcanoes.usgs.gov/); Emergency Management Office, Commonwealth of the Northern Mariana Islands, PO Box 100007, Saipan, MP 96950, USA (URL: http://www.cnmihsem.gov.mp/); Washington Volcanic Ash Advisory Center, Satellite Analysis Branch (SAB), NOAA/NESDIS E/SP23, NOAA Science Center Room 401, 5200 Auth Rd, Camp Springs, MD 20746, USA (URL: http://www.ospo.noaa.gov/Products/atmosphere/vaac/); Hawai'i Institute of Geophysics and Planetology (HIGP) Thermal Alerts System, School of Ocean and Earth Science and Technology (SOEST), University of Hawai'i, 2525 Correa Road, Honolulu, HI 96822, USA (URL: http://modis.higp.hawaii.edu/). A small steam plume was observed at Pagan (figure 9) in April 2009 and a thermal anomaly was recorded in August 2009 (BGVN 34:09). Unofficial reports indicated that weak steam and gas plumes may have occurred between August 2009 and April 2010. Monitoring is by satellite and ground observers; there are no instruments installed. Figure 9. Two illustrations showing the N portion of Pagan Island. (left) A diagram with shaded-relief labeling some key features. (right) Geologic map of Pagan Island (see Trusdell and others, 2006, for lithologic key). According to the U.S. Geological Survey (USGS), steam and gas plumes were observed in MODIS satellite images on 21, 22, and 28 April 2010. Minor steam and gas plumes have been observed often in the past, and do not necessarily indicate the imminence of an eruption. A visitor to the island reported a minor gas emission on 3 May 2010, and a steam and gas plume was observed on ASTER imagery on this date. On 6 May 2010, minor ashfall was confirmed and steam and gas emissions were seen on satellite imagery. During 7-28 May 2010, satellite imagery revealed steam plumes from Pagan that drifted W. On 21 and 23 May, a U.S. Fish and Wildlife Service research crew camping on the island reported that a trace amount of ash was deposited on their tents from a possible ash emission during the night. Due to concerns about the potential for escalation of activity and the subsequent eruption of Sarigan (~ 150 km S of Pagan), the research crew left Pagan Island on 30 May 2010; since that time no direct observations of activity have been made. Minor gas and steam plumes continued into June. A false-color satellite image on 3 June (figure 10) showed a minor gas-and-steam plume; the blue tint of the plume hints that it may be rich in sulfate aerosols. During 18 June-2 July, minor gas-and-steam plumes were observed in satellite imagery. According to the Washington Volcanic Ash Advisory Center, a small cloud of ash mixed with a gas plume was seen on 5 July in satellite imagery. Figure 10. False-color image of Pagan acquired 3 June 2010 by the Advanced Spaceborne Emission and Reflection Radiometer aboard NASA's Terra satellite. Vegetation, colored bright red, stands in contrast to dark lava flows. The central flows were erupted in 1981, while the smaller flows on the northeastern coastline date to 1872-1873. Courtesy of NASA Earth Observatory; image by Jesse Allen and Robert Simmon using data from the NASA/GSFC/METI/ERSDAC/JAROS, and U.S./Japan ASTER Science Team; caption by Robert Simmon. On 11 August, observers working on a boat reported that a low-level ash eruption produced a diffuse, dark-colored ash-and-steam plume that rose to an altitude of 1.5 km and caused minor ashfall on northern Pagan Island and the surrounding ocean. In September 2010, volcanic unrest continued at Pagan, with occasional weak steam and gas plumes. When accessed in September 2010, MODVOLC thermal alerts have been absent for the last 10 years. Reference. Trusdell, FA, Moore, RB, and Sako, MK, 2006, Preliminary Geologic Map of Mount Pagan Volcano, Pagan Island, Commonwealth of the Northern Mariana Islands, U.S. Geological Survey, Open-File Report 2006-1386 (URL: http://pubs.usgs.gov/of/2006/1386/). During 24 and 26-27 October and 1-4 November 2010, low-level gas-and-steam plumes were observed in satellite imagery. On 23 February 2011, the Aviation Color Code for Pagan was downgraded from Yellow to Unassigned, and the Volcano Alert Level from Advisory to Unassigned. No MODVOLC thermal alert for Pagan has been issued for the last 10 years; however, infrequent thermal anomalies from other systems that have less stringent criteria than MODVOLC have been reported. As background, following a small eruption in 2006 and in subsequent behavior through September 2010, Pagan has been mostly quiet, with plumes that occasionally contained some ash (BGVN 32:01, 34:09, and 35:07). Pagan is not monitored with ground-based geophysical instrumentation. The only sources of information are satellite observations and occasional reports from observers who pass or visit the island. General References. Koyanagi, R., Kojima, G., Chong, F., and Chong, R., 1993, Seismic monitoring of earthquakes and volcanoes in the Northern Mariana Islands: 1993 summary report: Prepared for the Office of the Governor, Commonwealth of the Northern Mariana Islands, Capitol Hill, Saipan MP 96950 (revised 21 February 1993), 34 p.
Trusdell, F. A., Moore, R. B., and Sako, M. K., 2006, Preliminary Geologic Map of Mount Pagan Volcano, Pagan Island, Commonwealth of the Northern Mariana Islands, U.S. Geological Survey, Open-File Report 2006-1386 (URL: http://pubs.usgs.gov/of/2006/1386/). Information Contacts: Emergency Management Office of the Commonwealth of the Northern Mariana Islands (EMO-CNMI) and USGS Volcano Hazards Program, PO Box 100007, Saipan, MP 96950, USA (URL: http://www.cnmihsem.gov.mp/ and http://volcanoes.usgs.gov/nmi/activity/); Washington Volcanic Ash Advisory Center (VAAC), Satellite Analysis Branch (SAB), NOAA/NESDIS E/SP23, NOAA Science Center Room 401, 5200 Auth Rd, Camp Springs, MD 20746, USA (URL: http://www.ospo.noaa.gov/Products/atmosphere/vaac/); Hawai'i Institute of Geophysics and Planetology (HIGP) Thermal Alerts System, School of Ocean and Earth Science and Technology (SOEST), Univ. of Hawai'i, 2525 Correa Road, Honolulu, HI 96822, USA (URL: http://modis.higp.hawaii.edu/). 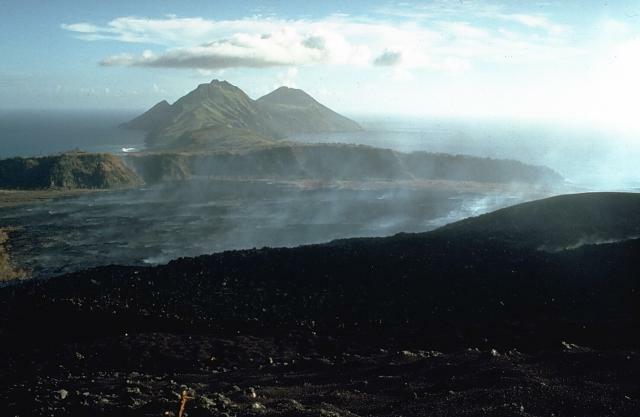 Pagan Island, the largest and one of the most active of the Mariana Islands volcanoes, consists of two stratovolcanoes connected by a narrow isthmus. Both North and South Pagan stratovolcanoes were constructed within calderas, 7 and 4 km in diameter, respectively. The 570-m-high Mount Pagan at the NE end of the island rises above the flat floor of the northern caldera, which may have formed less than 1000 years ago. South Pagan is a 548-m-high stratovolcano with an elongated summit containing four distinct craters. Almost all of the historical eruptions of Pagan, which date back to the 17th century, have originated from North Pagan volcano. The largest eruption of Pagan during historical time took place in 1981 and prompted the evacuation of the sparsely populated island. Banks N G, Koyanagi R Y, Sinton J M, Honma K T, 1984. The eruption of Mount Pagan volcano, Mariana Islands, 15 May 1981. J. Volcanol. Geotherm. Res., 22: 225-270. Bloomer S H, Stern R J, Smoot N C, 1989. Physical volcanology of the submarine Mariana and Volcano arcs. Bull Volcanol, 51: 210-224. Moore R B, 1993. (pers. comm.). Trusdell F A, Moore R B, Sako M K, 2006. Preliminary geologic map of Mount Pagan volcano, Pagan Island, Commonwealth of the Northern Mariana Islands. U S Geol Surv Open-File Rep, 2006-1386: 1-32. There is data available for 24 Holocene eruptive periods. Remarks: InSAR measurements from both the ALOS and Envisat satellites show deformation near the 1981 May VEI 4 lava flow eruption on North Pagan at 2-3 cm/year between 2004-2010. Reference List: Jay et al. 2014*. Jay, J. A., 2014. A geophysical survey of active volcanism in the central and southern Andes. Ph.D. thesis, Cornell University, 270 pp. 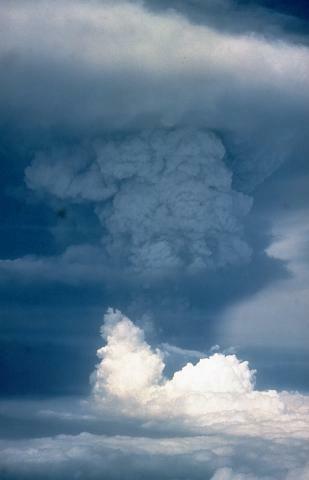 A vertical eruption column towers above Pagan volcano on May 18, 1981, three days after the onset of the 1981 eruption. The initial eruption on May 15 produced eruption plumes that rose to estimated heights of 16-20 km. Three vents along a fissure that cut the summit of North Pagan volcano were active on May 15. An upper NE flank cone produced a new cinder cone, and vents on the north and south summit crater rims issued lava flows that traveled down the north and south flanks. Intermittent explosive activity continued until 1985. Photo by Gary Haust, 1981 (courtesy Norm Banks, U.S. Geological Survey). Steam rises from the surface of the massive lava flow that is advancing below the south flank of North Pagan volcano in 1981. The flow was erupted May 15-26, 1981, from a vent on the south crater rim and spread out over the broad caldera floor, eventually reaching to the southern caldera wall. The foreground area on the flanks of North Pagan consists of pyroclastic-surge deposits from the 1981 eruption. This May 21, 1981, photo looks to the SW with South Pagan volcano forming the conical peak at the right. Photo by Norm Banks, 1981 (U.S. Geological Survey). A black, steaming lava flow advances across the floor of a maar on the west flank of North Pagan volcano on May 23, 1981. The flow originated from the summit crater of North Pagan (background) on May 15. Most of the foreground surface of a lagoon on the floor of the maar is covered by black, floating pumice from the powerful explosive eruptions of the 15th. 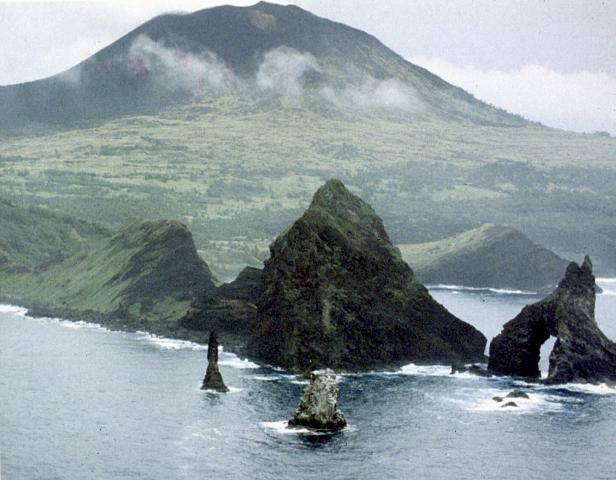 Two maars cut the western flank of North Pagan volcano. Pyroclastic-surge deposits from the latest eruption of the 1.5-km-wide eastern maar, seen here from the NE with South Pagan volcano in the distance, were radiocarbon dated at about 150 years ago. 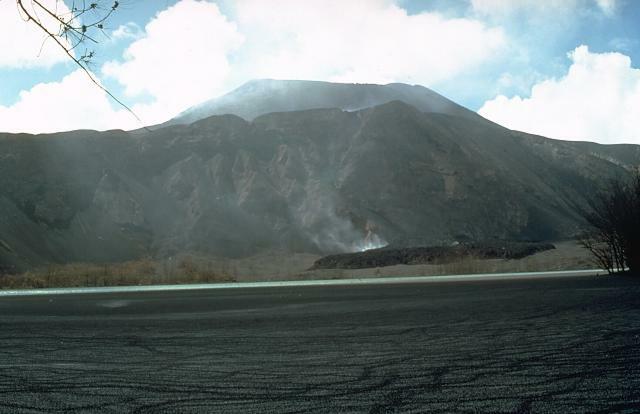 This May 24, 1981 photo shows a steaming lava flow on the floor of the maar. It originated from the summit crater of North Pagan volcano during an eruption that began on May 15. 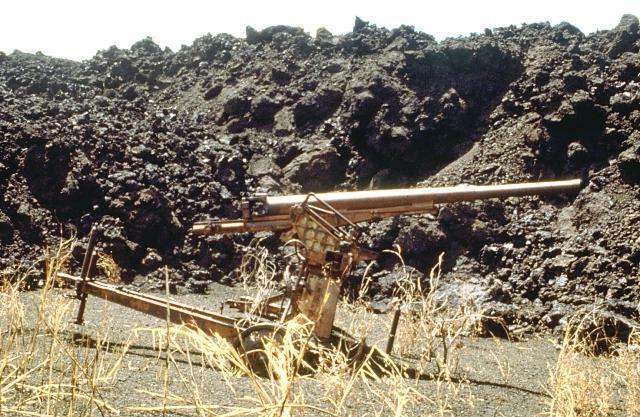 The SW-flank lava flow from the May 1981 eruption overran a Japanese World War II bunker and ashfall from the eruption partially buried this anti-aircraft gun. The SW-flank flow traveled 3 km from its vent on the south crater rim. Other flows traveled down the north flank almost to the coast. A fissure that formed during an eruption of Pagan volcano in the Mariana Islands in 1981 cuts across the summit of the volcano. Three principal vents were active along the fissure. A cinder cone (foreground) was constructed on the north flank, and vents on the north and south rims of the summit crater fed lava flows that traveled down the flanks of North Pagan volcano. This June 16, 1981 photo shows South Pagan volcano at the upper right. Photo by U.S. Navy, 1981. This south-looking view across the isthmus of Pagan Island shows Alamagan Island in the distance. The arcuate wall cutting across the center of the photo is the southern rim of a 7-km-wide caldera inside which North Pagan volcano was constructed. The lake in the foreground is the westernmost of two maars that cut the western flank of North Pagan. The black lava flow on the caldera floor at the left center in this June 16, 1981 photo was erupted from a vent on the south rim of North Pagan volcano beginning on May 15, 1981. South Pagan volcano occupies the SW end of Pagan Island. 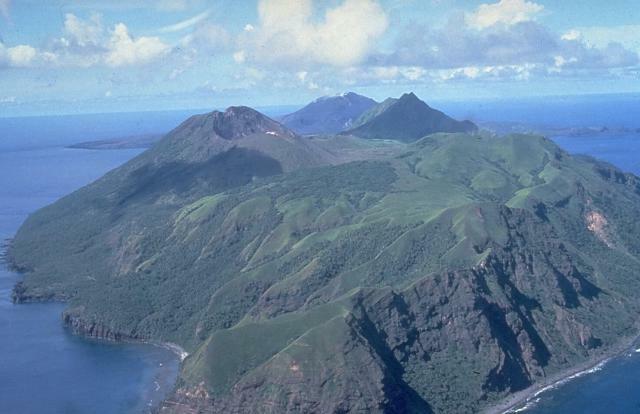 The ridge in the right foreground is the eroded rim of a 4-km-wide caldera inside which the conical South Pagan volcano (left) was constructed. The elongated summit of South Pagan is cut by four craters. Eruptions of South Pagan volcano occurred during the 19th century, but it has been much less active than North Pagan volcano, the peak at the far center on the NE tip of the island. Pagan Island, the largest and one of the most active of the Mariana Islands, consists of two stratovolcanoes connected by a narrow isthmus. Both the North and South Pagan stratovolcanoes were constructed within calderas. North Pagan, the most active of the two, is seen here from the west coast of the isthmus SW of the summit. The 570-m-high North Pagan was constructed within a 7-km-wide caldera. South Pagan is a 548-m-high stratovolcano with an elongated summit containing four distinct craters. Photo by Norm Banks, 1983 (U.S. Geological Survey). A prominent eruptive fissure cuts across the summit of North Pagan volcano on May 15, 1981, on the opening day of the 1981 eruption. 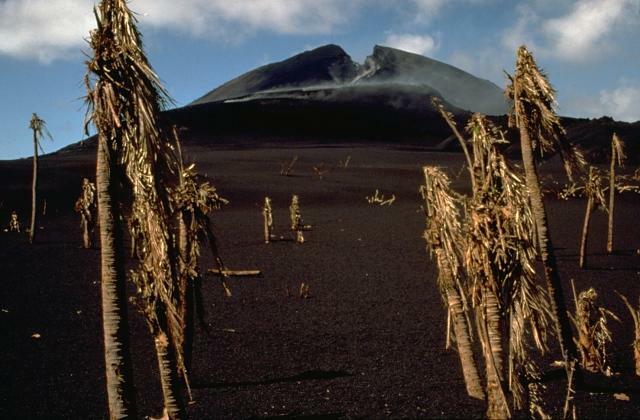 It is seen here on May 26, 1981, looking across a north-flank cinder cone that formed along the fissure during the 1981 eruption. The foreground trees are from a devastated coconut plantation. North Pagan volcano rises above the Sengan Peninsula on its SSE flank. The peninsula is eroded from rocks of a pre-North Pagan volcano that was truncated by a 7-km-wide caldera. North Pagan volcano, the most active of two volcanoes on Pagan Island, was constructed within the past 3000 years. Photo by U.S. Navy, 1982. An aerial view of Pagan volcano from the west in August 1981 shows dark lava flows from the May 1981 eruption that descended the south flank as far as the arcuate caldera wall. The flows originated from a vent along a notch on the south rim of the summit crater of North Pagan volcano early in an eruption that began on May 15. This was the southernmost of three vents that were active during the 1981 eruption. The Global Volcanism Program has no maps available for Pagan. The following 38 samples associated with this volcano can be found in the Smithsonian's NMNH Department of Mineral Sciences collections, and may be availble for research (contact the Rock and Ore Collections Manager). Catalog number links will open a window with more information. Large Eruptions of Pagan Information about large Quaternary eruptions (VEI >= 4) is cataloged in the Large Magnitude Explosive Volcanic Eruptions (LaMEVE) database of the Volcano Global Risk Identification and Analysis Project (VOGRIPA).